Music Director Marin Alsop will lead the Baltimore Symphony Orchestra in Tchaikovsky’s highly popular Symphony No. 5 on Thursday, March 22 at 8 p.m. at the Music Center at Strathmore, and Friday, March 23 and Saturday, March 24 at 8 p.m. at the Joseph Meyerhoff Symphony Hall. Percussionist Colin Curie will perform Jennifer Higdon’s Percussion Concerto.The program also includes Copland’s Fanfare for the Common Man, paired with Joan Tower’s Fanfare for the Uncommon Woman. Music Director Marin Alsop will lead the Baltimore Symphony Orchestra in Tchaikovsky’s highly popular Symphony No. 5 on Thursday, March 22 at 8 p.m. at the Music Center at Strathmore, and Friday, March 23 and Saturday, March 24 at 8 p.m. at the Joseph Meyerhoff Symphony Hall. 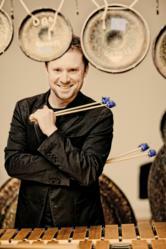 Percussionist Colin Curie will perform Jennifer Higdon’s Percussion Concerto, which won a Grammy for Best Contemporary Classical Composition in January 2010. The program also includes Copland’s Fanfare for the Common Man, paired with Joan Tower’s Fanfare for the Uncommon Woman. Over forty years after Copland wrote the famous brass-and-drums salute in Fanfare for the Common Man, Joan Tower gave it a bookend with her own Fanfare for the Uncommon Woman, which uses the same blazing brass and roaring percussion to pay tribute to “women who take risks and are adventurous.” Please see below for complete program details. Copland’s Fanfare for the Common Man was commissioned by conductor Eugene Goosens as one of eighteen fanfares honoring those engaged in WWII that were premiered during the Cincinnati Symphony’s 48th season. Goosens was very impressed when he received the score from Copland, telling him, “It deserves a special occasion for its performance. If it is agreeable to you, we will premiere it 12 March 1943 at income tax time.” To which Copland responded, “I [am] all for honoring the common man at income tax time.” Certainly, taxes were a major issue for the common man in March of 1943; America was 15 months into the war, government spending had soared, and only one in seven taxpayers had managed to save enough to pay federal taxes. Inspired by Copland’s popular fanfare, Joan Tower’s Fanfare for the Uncommon Woman was composed in 1986 and calls for the same instrumentation as the Copland. Like Copland, Joan Tower was born in New York, however at age nine she and her family moved to Bolivia, an event that profoundly shaped her future compositional voice. Today she is considered one of the most important living American composers. The Grammy Award-winning composer dedicated Fanfare for the Uncommon Woman to Marin Alsop, who conducted a recording of the piece with the Colorado Symphony shortly after it was written. Hailed as one of the world’s leading conductors for her artistic vision and commitment to accessibility in classical music, Marin Alsop made history with her appointment as the 12th music director of the Baltimore Symphony Orchestra. With her inaugural concerts in September 2007, she became the first woman to head a major American orchestra. She also holds the title of conductor emeritus at the Bournemouth Symphony in the United Kingdom, where she served as the principal conductor from 2002-2008, and is music director of the Cabrillo Festival of Contemporary Music in California. In 2005, Ms. Alsop was named a MacArthur Fellow, the first conductor ever to receive this prestigious award. In 2007, she was honored with a European Women of Achievement Award, in 2008 she was inducted as a fellow into the American Academy of Arts and Sciences and in 2009 Musical America named her “Conductor of the Year.” In November 2010, she was inducted into the Classical Music Hall of Fame. In February 2011, Marin Alsop was named the music director of the Orquestra Sinfônica do estado de São Paulo (OSESP), or the São Paulo State Symphony Orchestra, effective for the 2012-13 season. Ms. Alsop was named to Guardian’s Top 100 Women list in March 2011. In 2011 Marin Alsop was named an Artist in Residence at the Southbank Centre in London, England. A regular guest conductor with the New York Philharmonic, The Philadelphia Orchestra, London Symphony Orchestra and Los Angeles Philharmonic, Ms. Alsop appears frequently as a guest conductor with the most distinguished orchestras around the world. In addition to her performance activities, she is also an active recording artist with award-winning cycles of Brahms, Barber and Dvořák. Marin Alsop attended Yale University and received her master’s degree from The Juilliard School. In 1989, her conducting career was launched when she won the Koussevitzky Conducting Prize at Tanglewood where she studied with Leonard Bernstein. The soloist of choice for composers from Reich to Rautavaara, Colin Currie has been the driving force behind new percussion repertoire for more than a decade. Acclaimed for his virtuosity and musical integrity, Currie is a solo and chamber artist at the peak of his powers. Championing new music at the highest level, Currie is soloist with many of the world’s leading orchestras, such as the Concertgebouw Orchestra, Philadelphia Orchestra, Los Angeles Philharmonic, Philharmonia Orchestra and London Philharmonic. Currie’s “athletic percussionism, compulsive showmanship and deep musicality” (The Guardian) has inspired composers from around the globe, and forthcoming commissions include new works written for Currie by Steve Reich, James MacMillan and Louis Andriessen. From his earliest years Currie forged a pioneering path in creating new music for percussion. He was awarded the Royal Philharmonic Society Young Artist Award in 2000 for his inspirational role in contemporary music-making, and recent projects include premieres by composers such as Simon Holt, Kurt Schwertsik, Einojuhani Rautavaara, Jennifer Higdon, Alexander Goehr, and most recently Elliott Carter, whose double concerto entitled Conversations was premiered by Currie with Pierre-Laurent Aimard at the Aldeburgh Festival in June 2011, conducted by Oliver Knussen. Currie is Artist in Residence at London’s Southbank Centre from the 2011/12 season onwards, a role which will allow Currie to develop new relationships with artists and ensembles across a variety of art forms, as well as take part in collaborative and educational projects. The residency also involves several major commission projects in future seasons including the world premiere of Kalevi Aho’s Percussion Concerto which Colin performs in April 2012 with the London Philharmonic Orchestra conducted by Osmo Vänskä. Currie’s other world premiere performances of this season include engagements with the Los Angeles Philharmonic under Gustavo Dudamel in a new work by Joseph Pereira, Sally Beamish’s percussion concerto Dance Variations with the Swedish Chamber Orchestra followed by performances with the Scottish Chamber Orchestra and at Stanford Lively Arts in California, and Askell Masson’s Percussion Concerto with the Turku Philharmonic. Currie’s recording of Rautavaara’s Incantations with the Helsinki Philharmonic under John Storgårds is released in Spring 2012 on the Ondine label. Previous CD releases by Currie include Jennifer Higdon’s Percussion Concerto conducted by Marin Alsop with the London Philharmonic Orchestra, a disc which won a 2010 Grammy Award, and Currie’s recital disc Borrowed Time, which features music by British composer Dave Maric and is available on the Onyx label. Tickets range from $33 to $93 and are available through the BSO Ticket Office, 410.783.8000 or BSOmusic.org.